This is an easy 3-ingredient green papaya salad recipe (Gỏi Đu Đủ Khô Bò) you can throw together in a few minutes. There’s no cooking required, just easy prep so you can get to snacking. 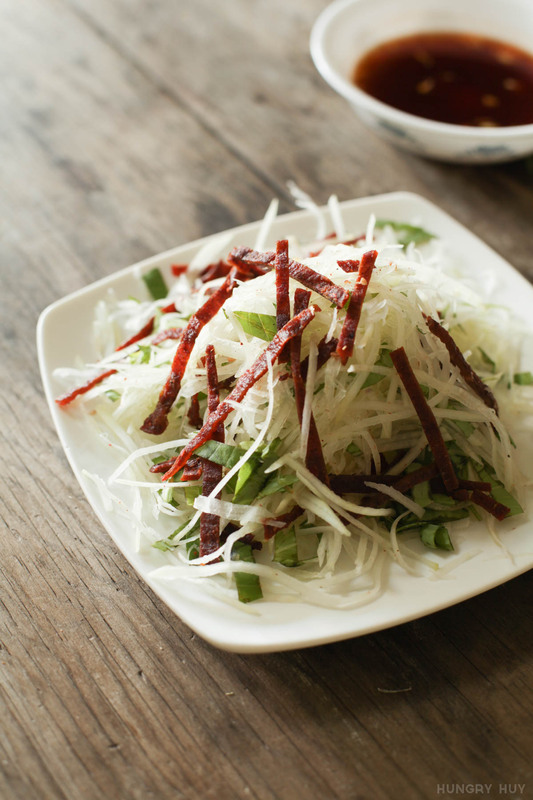 Green papaya and beef jerky salad is a light appetizer, a great choice for a snack or appetizer. My mom says she used to buy this from food carts in Vietnam. Students would swarm the food carts during lunch break. It was popular because of its affordability and great taste, even if students didn’t get as much beef jerky as shown above. 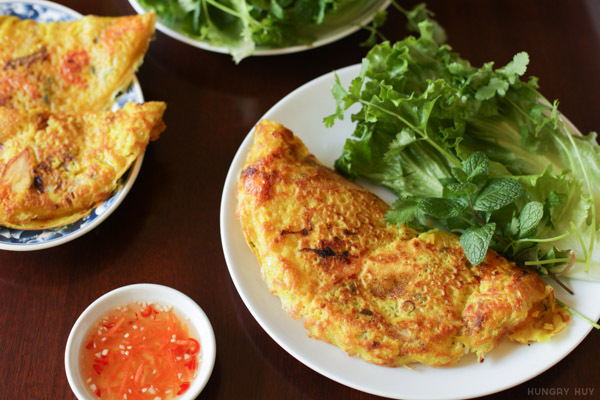 You can find this appetizer at some Vietnamese restaurants, but it’s easy enough to make at home. I really enjoy this version and the vegetarian version of this salad too. If you don’t speak Vietnamese it might be a strange if someone asks you to eat some đu đủ. It’s just papaya though! My family has a joke with the same idea: whenever they get unappetizing papaya it’s inevitably dubbed đi đỉ, which is exactly what you thought đu đủ was. Green papaya is the unripened version of the orange papaya you see often in American markets. Buying green papaya is easy. A fresh one is green, with smooth skin and very firm to the touch. Older papayas won’t be as shiny, and the flesh will be kind of soft, which we don’t want. Green papaya does not ripen if you let it sit around. It’s picked green and meant to be eaten as is so if you wait too long it just goes downhill. I found this papaya at a local Indian market for $1.50 per pound, which is about the same price as ripe papaya. Sometimes you can find it for as low as $0.80 per pound. 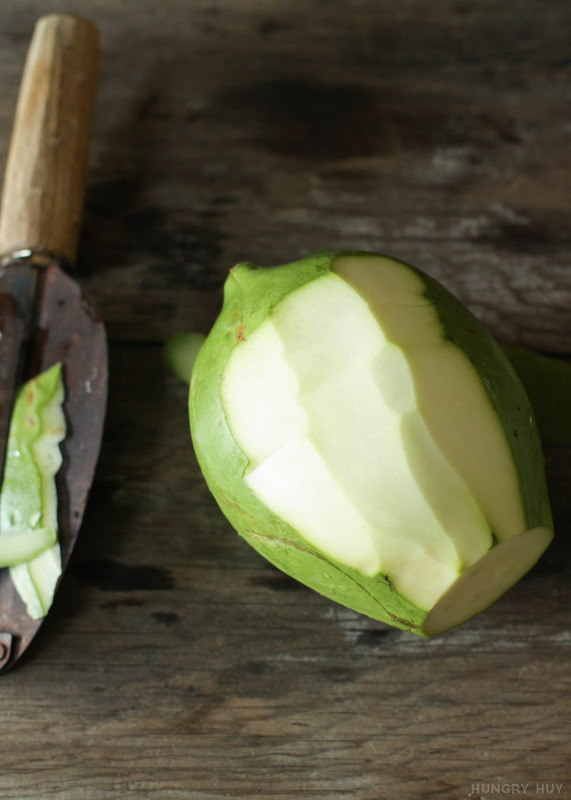 During the off-season, green papaya’s flavor is about 80% there for double the cost. You can find this in Southeast Asian markets. Vietnamese is a good bet, but Thai and Lao folks commonly eat raw green papaya like this so you can try at those markets too. Above is the inside of a green papaya with the little seeds removed. My mom recently gave me a new slicer that she and a bunch of her aunties have been raving about. 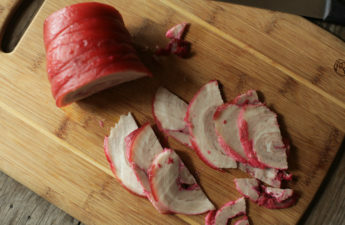 The one shown in the above picture is the Benriner Japanese Mandoline Slicer. My mom has been using this same one for over 20 years, all the way back since her restaurant days and its still sharper than the Swissmar slicer I’ve been using. It cuts through green papaya like butter. It’s so sharp, in fact that a few of my aunties gave up mandoline slicers from fear of cutting themselves. This is nonsense, probably because they don’t know you can just throw on some cut-resistant gloves and you’re golden. The ones I’m wearing above are Epica brand and they worked great, providing a slight grip too. You can use both the gloves and the cutting guard if you really want, but there’s no reason to avoid mandoline slicers altogether! 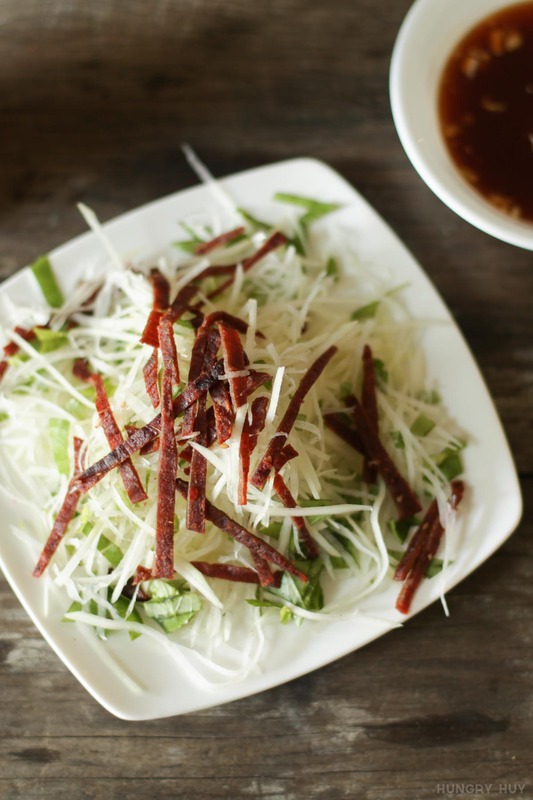 This Vietnamese salad is thought to have originated in Laos, but is also popular in other Southeast Asian countries like Thailand and Cambodia. Many variations of this dish exist, even subbing out the papaya for other fruits including banana flower, pomelo, cucumber, and green mango. 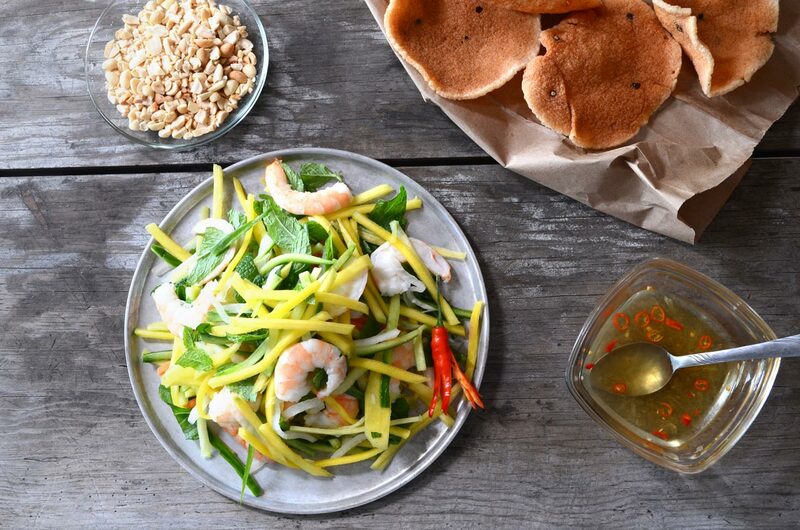 There’s a popular Vietnamese version of the green mango salad with shrimp too (recipe coming soon!). If you live near a Vietnamese community, the easiest place to find the jerky is in Vietnamese supermarkets. Some take-out only food places near me in Southern California’s Little Saigon carry this too. 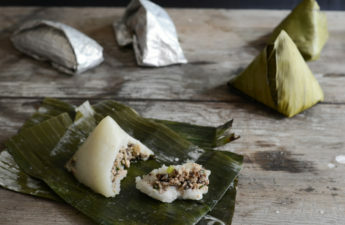 This is often eaten as beer snacks, or to nhau. Another place you can find this is in those Vietnamese-Chinese stores that sell preserved foods. The store setups look similar to American taffy stores, with large barrels side-by-side, covering the entire floor. You want the dry and red-ish looking one. There’s a sticky version, and a curry version of the beef jerky, which are good too, but not what you want for this salad. If you don’t have Viet markets nearby you can get the kind of beef jerky Costco carries too. The flavor is good, but the sheets of jerky are pretty thick, so you can cut the strips thinner to compensate. By comparison, the Vietnamese/Chinese version is sold pre-cut, and has a slightly sweeter taste. 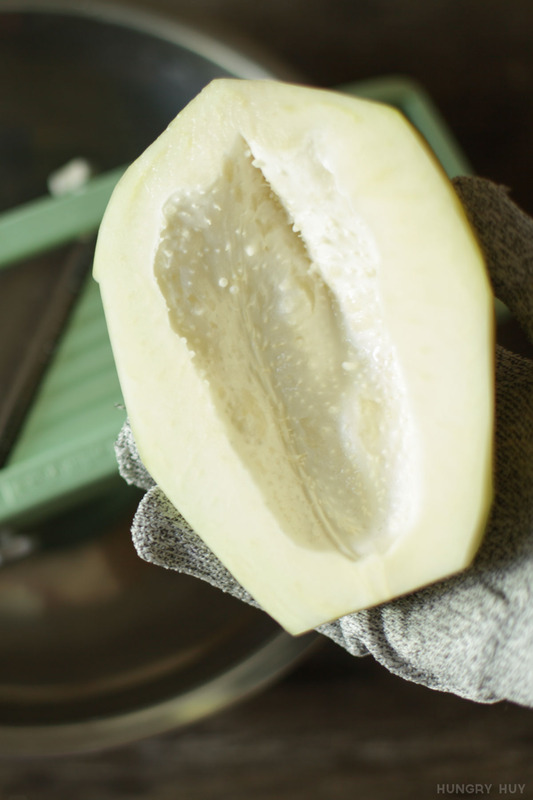 Peel, de-seed, and shred the papaya. Toss shredded papaya with basil. Top with beef jerky strips and dressing, to taste. Hey Hang, other versions of this salad are good too, but this is the super easy way that still tastes good.. if I can do it anyone can ha! Haha Hang–you’re giving me some recipe ideas……. I love your blog! I follow it but like a lurker never post any comments! I’ve follow a few recipes and they are delicious! I also think that you write well with a great sense of humor! 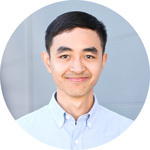 Also although I am Vietnamese but bi mat goc cho nen khong biet nhieu Vietnamese! I feel like i also pick up some cultural notes from your blog! Best of all the pictures make me drool! Hey! It’s pretty awesome to hear you’ve come out of hiding to leave a comment :). 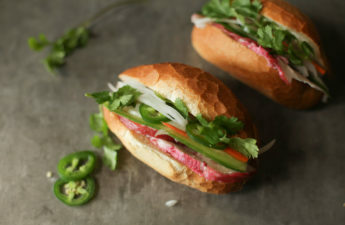 My Vietnamese isn’t all to great either but I do learn when trying new Vietnamese recipes hehe. Thank you for all the kind words Natalie, hope to see you around here more often! Your step-by-step instructions are so easy to follow and understand. This Papaya & Beef Jerky Salad is our first try. We love it. Thanks, Huy. Just found your blog! Your recipe looks very light and refreshing. Thank you for your tips on buying green papaya. 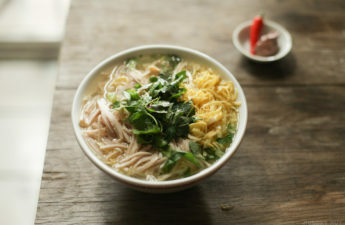 I’m hoping I can find it at a Southeast Asian grocery in Minneapolis. You said above that it is best to buy green papaya in season. Can you clarify, is now a good time to look for green papaya, or should I wait until until June-July? Thank you for this delicious looking recipe!